Today we will take a look at adding questions to question groups in Event Espresso. Lets begin by taking a look at the Registration Form screen for Event Espresso. The Questions tab is shown by default when you click through to the Registration Form from the WordPress admin menus. A question in Event Espresso can be thought of as the a specific piece of information that you are requesting from an attendee/registrant. If we look at the screenshot above, we see two examples of questions: First Name and Last Name. What kind of information would you expect to see in the personal information question group? For this question group, Event Espresso asks for contact information such as first name, last name, and email. For the address information question group, Event Espresso asks for information that is related to the address of the attendee/registrant such as street address and even phone number. Now that we have a basic understanding of what questions and question groups are, lets take a look at creating a new question group and associating questions with it. Note: certain questions cannot be deleted as these are system questions. 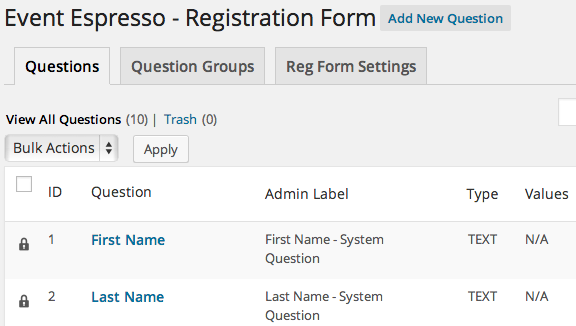 These are the questions that Event Espresso needs to create registrations correctly. Important: please make sure that a question is only assigned to one question group. This will help avoid having the question duplicated on the registration form and causing validation errors that may stop registrations. From the Registration Form screen, click on Question Groups. Then click on the button at the top of the page that says Add New Question Group. You’ll then arrive at the Question Group editor and you can begin entering information about your new question group. Go ahead and enter a title or name for your question group. You can enter a group identifier or allow Event Espresso to create one for you (occurs after saving). The remaining fields are optional. When you are finished editing your question group, click on the save and close button. This will take you to your Questions Groups page. Now click on the tab for Questions and then click on the button that says Add New Question. You’ll then arrive at the Questions editor and you can begin entering information about your new question. Once you are finished, click on the save and close button. Then repeat these steps for additional questions. To link a question to a question group, place a checkmark next to those questions. You can also adjust the order that the questions will appear in by dragging and dropping them. Once you are happy with your changes, be sure to click on save and close. This will return you to your Questions Groups screen. Your question groups can also be sorted by using drag and drop. Keep in mind that this updated order for these questions and question groups will be used throughout Event Espresso including the WordPress admin and on the front end of your website.